Over two thousand people lined the avenue down to the finish in Place Vendom today… the ramp was up by mid-day in its position over the finish line opposite the Ritz Hotel, and everyone was in party mood. Flags flew, champagne corks popped. After helping us yesterday at Reims, Henriot had Magnums for the winning cars of the three categories. And the sun shone. We reckoned on around 105 would be crossing the line out of the 128 who set out 10,000 miles and 35 days ago. But two are missing… car 10, Tim and Chris Clemons in the big eight-litre V12 saloon failed to roll into the centre of town, which mystified us as nobody in the organisation had received a phone call and the sweep crews had not spotted the black Packard, but just as we feared they might lose their bronze medal Chris and Time reached Place Vedome with minutes to spare before the control point closed… and of course the sad news of Car One, the Itala of David and Karen Ayres. What do we know? Not a lot. It would appear they spent the night in jail in Metz, hauled in by the police. No accident, no crime, nothing has been reported back. The Paris Chief of Police, who is attending our dinner tonight, naturally made a few calls on our behalf… from what we gather, and this is all shrouded in mystery, is that the police are might upset by the behaviour of the Itala crew, and its nothing more than bad tempers all round…. but doesn’t it seem amazing that a car, albeit one off-route, should be held up this way? Even more odd is that in this day and age, no calls have been allowed. In 1907, Goddard chasing the Itala in his Dutch Spyker was thrown into jail for trivial offences on the final approach to Paris. History has a habit of repeating itself. It seems a driver 100 years on has landed in the same pickle. The Itala was missing at the head of the parade. 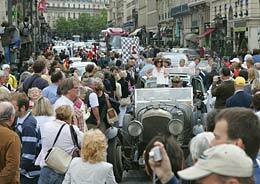 The champagne was popping until well into the middle of the afternoon and the cars are all lined up now in Place Vendome. Crews are getting ready for a party dinner tonight, with a film of the event, and presentation of over 70 magnificent trophies. Everyone is talking about the “next one.” There wasn’t going to be one. It was the last thing on our minds before we set out, but given the incredible spirit here in Paris, the last remaining route that has yet to be driven as a rally from Peking to Paris suggests itself… through the “Stans” of the Silk Route… we have been to Turkmenistan and Uzbekistan before, and know from the “Around the World in 80 Days” we organised seven years ago that this is perhaps the most beautiful route of the lot. For those who want something shorter with more comforts, then our African Safari is very special, but its restricted to 25 cars, set to run next year. Watch this space for more. 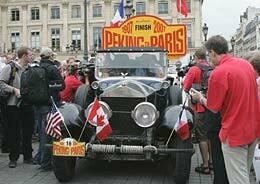 Meanwhile, keep an eye on this site for news of the book of Gerard Brown photos and words from Syd Stelvio, and all the results, which Veloce are publishing later this summer : Peking to Paris – the Full Story. Before signing off, there is something that has to be said. Rallying through remote parts of the world and being encouraged and cheered on by those less fortunate than ourselves ought to leave something behind. We ought to be capable to helping those who live with little hope, but whose life has been brightened by cheering a car with a number on the door, and meeting international rally drivers first hand. Events like these should be capable of putting something back, and leaving something positive behind, a permanent reminder, a real contribution. This is the reason we are announcing tonight an attempt by the Endurance Rally Association to contribute to the lives of the children of Ulaan Bataar in Mongolia. Some children were seen living in sewers. We hope to raise money from each and every crew member, who goes home with broken metal, big repair bills, and credit card bills to come, who will still find it within themselves to pledge a donation. We are discussing this with the British Embassy – our role is the be the catalyst that makes things happen. Already, various charities will benefit from individual efforts – over £250,000 has been raised for good causes already. Helping the children of Mongolia is something we can all do as a lasting reminder…big or small, if you want to chip in, send Syd Stelvio an email and we will be in touch. The money will be paid directly to a Mongolia charity, but the spending of it will be overseen by us. That’s it for now. We’re dashing off to the party…we sit down in the gilt and velvet ornate surroundings of the Grand Intercontinental Hotel with no less than 740 places….tonight is the last time we will be trying to beam out words and pictures of the 100th Peking to Paris…naturally, we all hope you have all enjoyed following our efforts to reports and updates from places so remote, they don’t even get a mention on the map. This hotel room is as all very sumptuous, giant Egyptian-cotton pillows, stacked up mini-bar, television with news programmes we have all forgotten for weeks, but claustrophobic and stuffy after what we have all just endured…getting back into the groove of “normality” won’t be easy for any of us. Me? The first thing Syd Stelvio is going to do is chill out, the tent is going up in the back garden, despite all the dust and grime from Outer Mongolia the sleeping bag is being unrolled, and the only company is going to be Arthur Ransome’s first book of ripping yarns, Swallows and Amazons.